Aim of the conference is to present recent results in the rigorous renormalization group approach developed for constructive QFT and statistical physics. In this context, we want to remember our friend and colleague Pierluigi Falco who gave important contributions to this field during his short life. The conference is financed by the PRIN 2010 "Teorie geometriche e analitiche dei sistemi Hamiltoniani in dimensioni finite e infinite" (P.I. Carlangelo Liverani), by the FIR 2013  "Condensed Matter in Mathematical Physics" (COND-MATH) (P.I. Michele Correggi), and by GNFM-INdAM. 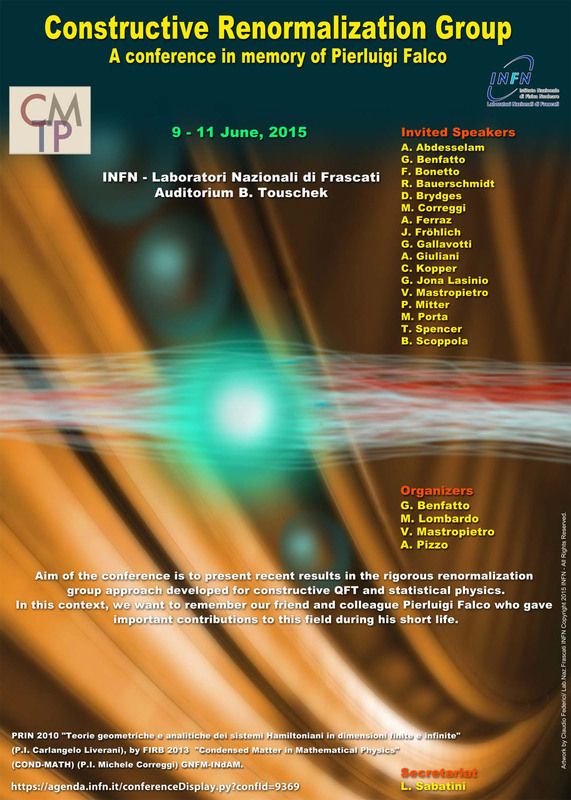 The conference is an activity that fits within the convention between the INFN and the Centre for Mathematics and Theoretical Physics (CMTP), University of Rome Tor Vergata.